If you’re looking for geometric wallpaper inspiration then look no further because you’ve come to the right place. 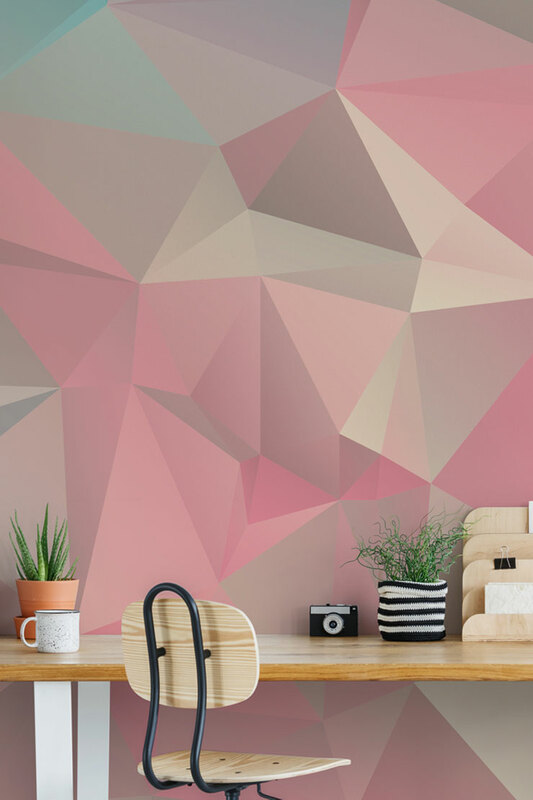 Geometric wallpaper is a combination of intricate patterns and shapes such as squares, hexagons and triangles with complementing contrasting colours that instantly add style to any room in your home. This eye-catching wallpaper design is not only on trend but also a design that is arguably timeless. It’s available in an array of colours both bright and subtle meaning you can express your personality within your interior décor. Whether it’s for your bedroom, living room, dining area, kitchen, or hallway, geometric patterns will really look great in any room. The sophisticated yet striking style of wallpaper means your wall literally comes to life and stands out. Geometric patterns can bring a modern edge to any room in your home and you can use them to create a fresh, contemporary look for a luxury atmosphere. One of the beauties of this style of wallpaper is how the different colours blend with each other, creating a vibrant and attractive aesthetic that makes an immediate impact when you enter the room. 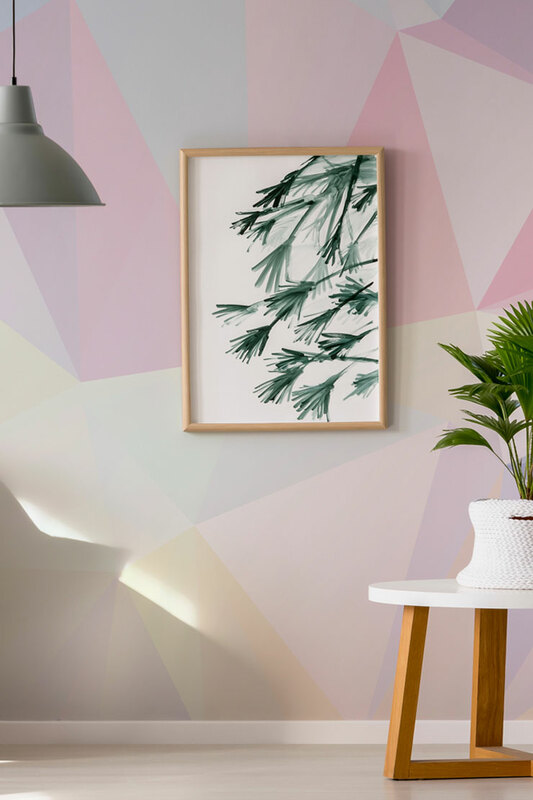 We have this stunning pastel range of geometric wallpaper and there are lots of ways in which you can use it in your home to make a statement. Geometric wallpapers are a great choice for creating a standout feature wall as a focal point of your room. However, some people do cover the whole room in the print. It’s all down to personal preference and when it comes to picking new wallpaper it’s important you have a play around with a few different ideas. Knowing how to style geometric wallpaper can be very daunting but it doesn’t have to be. If you’re looking to achieve a chic and stylish interior without overpowering your room then opt for a design that has a more simple style with softer colours. 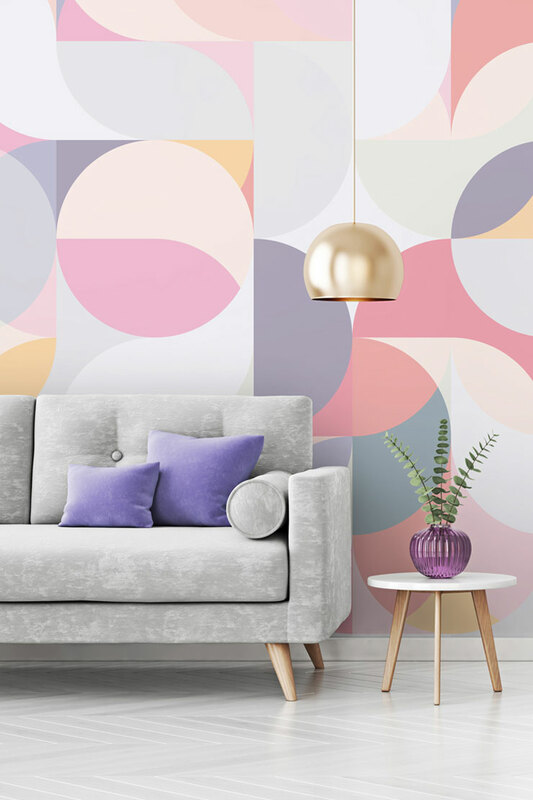 This wallpaper, 'Polygon Pastel' has a hue of the lovely ice-cream pastel colour and is combined with shapes that have delicate lines that don’t overwhelm your room. As this wallpaper has a neat and simple feel to it compared to other geometric wallpapers you could style your room with bolder colours. The light pastel shade of the wallpaper means you can style your room with darker block colour furniture and accessorise to make the colour contrast really pop. Alternatively, you could stick to light neutral colours, it’s really all down to the impact you want to make. Choosing the right furniture to complement your wallpaper is key in order to achieve a balanced look. 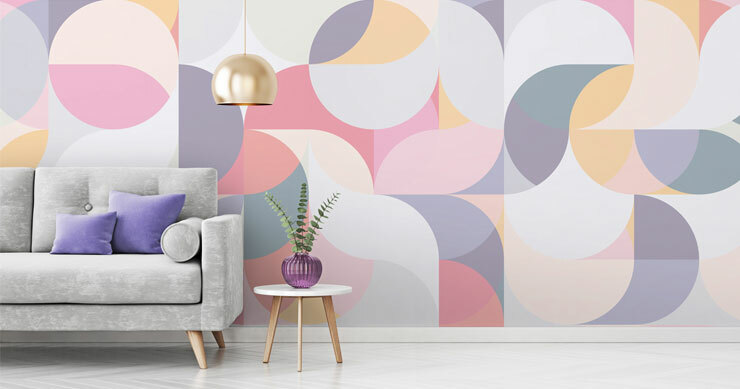 The contrast of the minimalist shapes and playful colours in this wallpaper means you can design a room that blends the colours with an intricate pattern, resulting in something super sleek and stylish. If you’re looking for wallpaper that has the traditional geometric shapes and a focus on patterns then something like this would look perfect. The large geometric shapes within this design would make for a modern, powerful feature wall. The contrasting light and dark pastel colours and patterns make this wallpaper, 'Harmonic Waves' really stand out and you can see flower shapes throughout the pattern. This gives you another element to consider when it comes to styling the room. When you have wallpaper like this you can choose to accessorise your room by keeping in-theme with the pattern. In this case, you could have ornaments, cushions or table covers with a pretty flower design. Another point to consider when it comes to styling is how many colours do you want to use. One simple way to achieve a harmonious look is to pick accessories in one or two key colours from the wallpaper. For example, you can take the pink from this wallpaper and have a few pink ornaments around the room and have a grey carpet and sofa. Grey and pink is such an attractive colour combo and with wallpaper like this, it’ll make your room look like a colour coordinated pastel wonderland. This wallpaper may be called 'Subtle Tones' but it’s anything but subtle. This 3D effect wallpaper is perfect for those looking to add multi-dimensional layers and textures to their room in a sophisticated yet super cool way. The 3D effect of the wallpaper gives the room depth and adds a unique touch to your home. It can also act as an optical illusion, creating the idea of a bigger and more spacious room. As the wallpaper has darker pastel colours you can accessorise the room with neutral colours and wooden furniture. One particular thing to ensure is that the colours you add to your room complement the geometric wallpaper opposed to competing with it. For this wallpaper pick colours such as white, beige, grey and black to complement the loud geometric print. The neutral furnishings will allow the wallpaper to take centre stage and not cause it to look chaotic. One of the great things about geometric wallpapers is the scope of possibility like this one shows. In addition to fun patterns, geometric designs can also bring colour and depth to your room. When styling geometric wallpaper it’s important you keep an open mind and have a creative spirit. Have fun with designing your new room and try different combinations to see what works best. 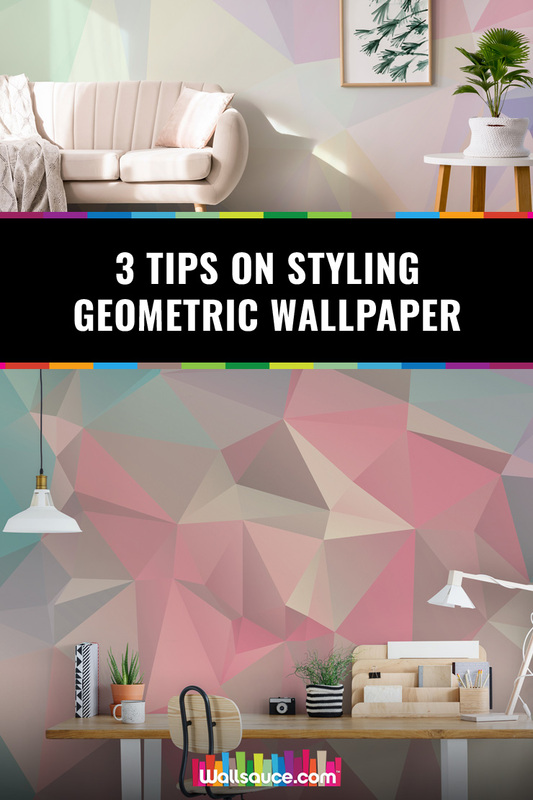 If you would like to know more about this style of wallpaper and the different designs it comes in, this geometric interior inspiration will tell you all you need to know. Choosing the right geometric wallpaper depends on the type of atmosphere you want to create in your room. Whether you’re going for a simple classy look or something bright and creative there are plenty of options for you to choose from. Check out our full collection of geometric wallpapers to see more amazing designs, fascinating patterns and lots of colours. What a stunning idea! Just love this concept. Loads of mix-and-match combinations can be achieved with furniture, drapes, and accessories. A bit of a retro effect - I adore retro. And I am going to try it soon!